I may have forgotten to mention in previous posts the crazy ideas my boss comes up with to sell books. His ideas do work, but guess who has to take his ideas and bring them to fruition? Me. And so the tale of the Strawberry-Jam-Making Madness for marketing begins. . . .
A few Tuesdays ago we were having our semiregular marketing update and brainstorming meeting. My boss mentioned that during the summer, without the big to-dos, like sales conferences, trade shows, and marketing mailings, our trade reps may forget about some of the important seasonal titles. One book in particular is so right-now, and if the reps don't push to get it into stores, then the season will pass and the book's usefulness will wane going into late fall and winter. 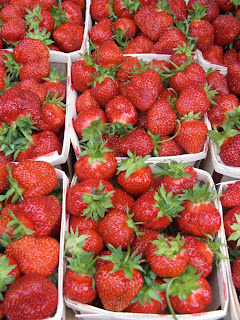 Fresh fruit is ripe now, but you can enjoy its fresh flavors in January. 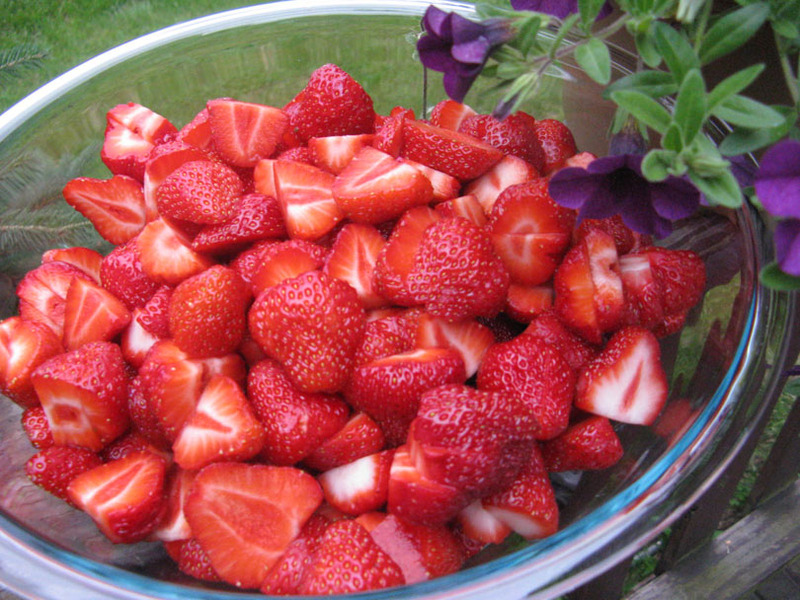 I turned native, fresh-picked strawberries into sweet, mouthwatering jam. It will stay fresh for a year! The book I am referring to is Put ’em Up!. This book teaches how to preserve, can, freeze, dry, brine, and so on all of the seasonal produce from spring through fall harvest. Whether you grow these edible gems in your backyard, get them from a CSA, or buy them fresh at the farmers’ market or local grocer, this book provides recipes and step-by-step techniques to keep produce at its best for seasons to come. When there is no more fresh, local produce to pick or buy, you can find it in your pantry. Delicious recipes range from the classics to gourmet to unique. As I said, the book is so right-now. Gardeners, cooks, homesteaders, and beginner preservers need this book in their hands while the fruit is ripe for pickin', literally. So, to get the reps out there selling, we need to remind them of this fabulous book. My boss’s idea was to make each trade rep and key buyer a jar of Classic Strawberry Jam from the recipe in the book, with a label reminding them that the recipe came from Put ’em Up! Now the ball is in my court. I needed to figure out how to get this done. . . .
We need about 20 jars of jam for the trade sales reps and about 20 more for key buyers. That is 40 jars of jam! The recipe in the book makes 4 jars. 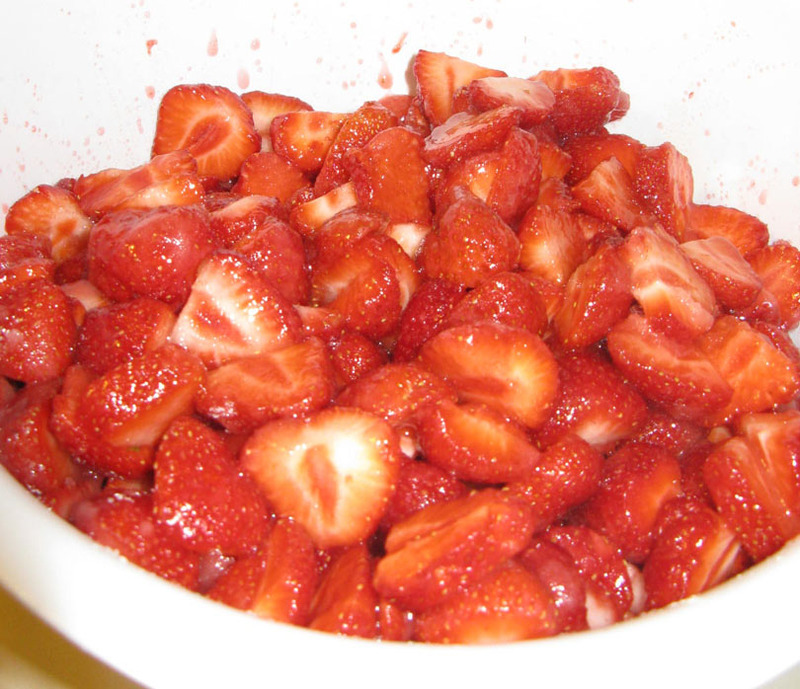 About 2 cups of cut strawberries = 1 pint-sized jar of strawberry jam. 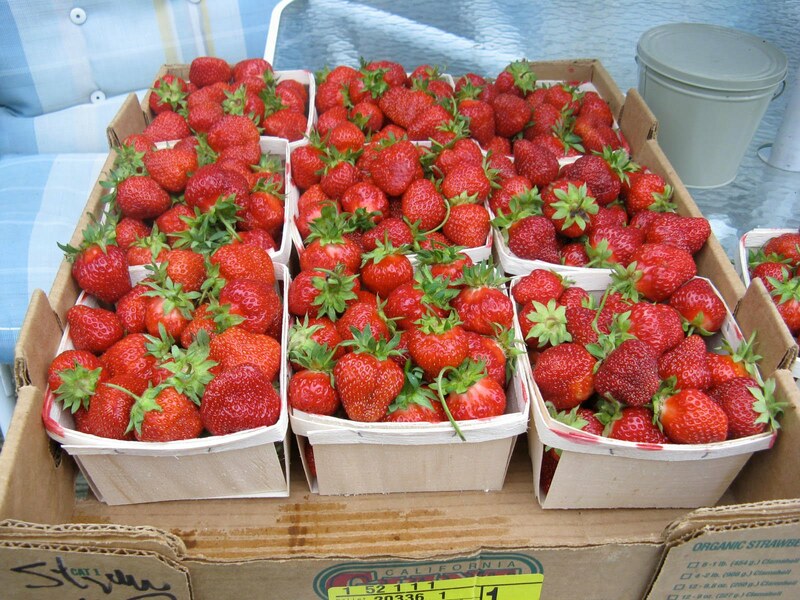 That's a lot of strawberries! 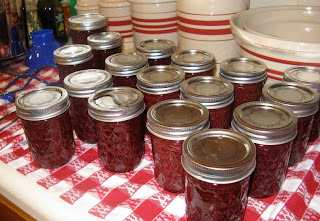 I used 12-1/2 quarts of strawberries in my jam sessions! “No way am I making all these myself,” I thought. And so I requested volunteer coworkers. I sent out an e-mail of what needed to be done; I bought the canning jars; I e-mailed a PDF of the recipe and a PDF of the jam-making techniques that Sherri (the author) includes in the beginning of the book; and I set out a sign-up sheet next to the canning jars in the office kitchen. Only three coworkers signed up, and only two of the three made any jam. One brought in 7 jars and the other 4; that left 29 more to go. 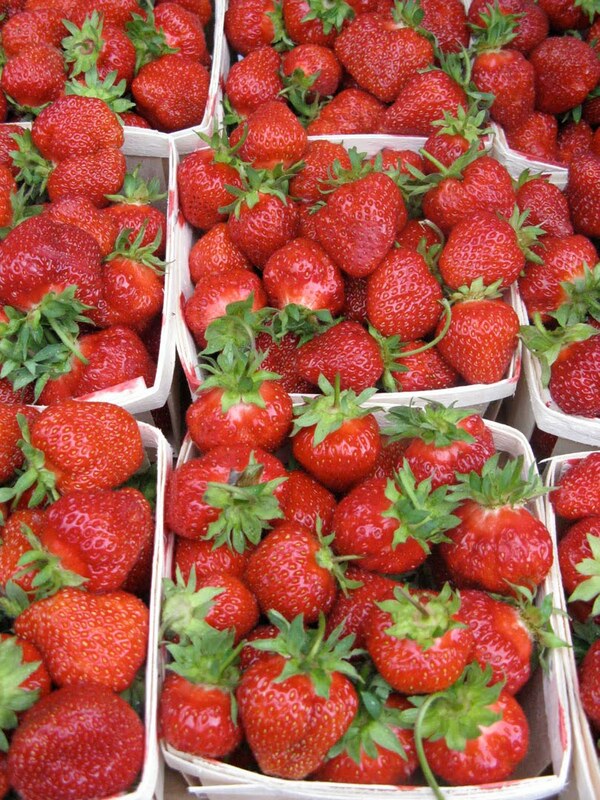 The Classic Strawberry Jam recipe requires that the cut strawberries macerate overnight — sit in the sugar called for by the recipe to release the natural juices in the fruit. I bought 4 quarts of strawberries on Wednesday, cut them and tossed them with sugar on Thursday night, and made my first batch of jam early on Saturday morning — yielding 4 pints. (or thirds if large) the night before. and put them in the fridge to macerate overnight. Four jars wasn't going to be enough — I needed to make more Sunday. I had a baby shower to attend Saturday afternoon, so I asked my sister if she could pick me up more strawberries. When I came home I had 10 more quarts waiting for me. 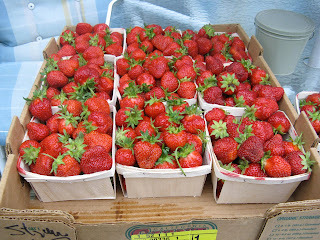 My sister picked up strawberries for me on Saturday afternoon. I found them waiting on the deck for me when I returned home. 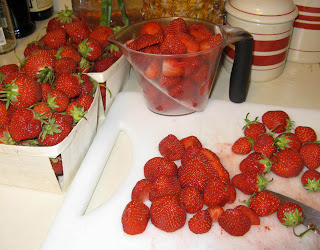 Saturday evening I cut up all but one quart of the berries, coated them with sugar, and put them in the fridge to macerate. I picked up my niece Jayde on Sunday morning so that she could help me make the jam. 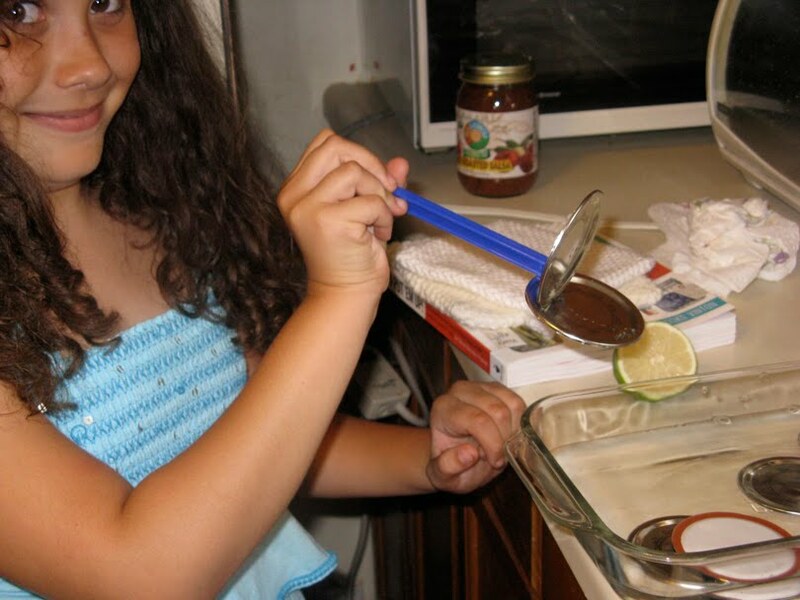 The two of us boiled, stirred, added lemon juice, boiled, stirred, prepared the lids, prepared the jars, set out all of the canning equipment, boiled, stirred, boiled the canning water, boiled, stirred, boiled, stirred. . . . Finally, after testing for gel per the author's suggested methods, the jam was thick enough. 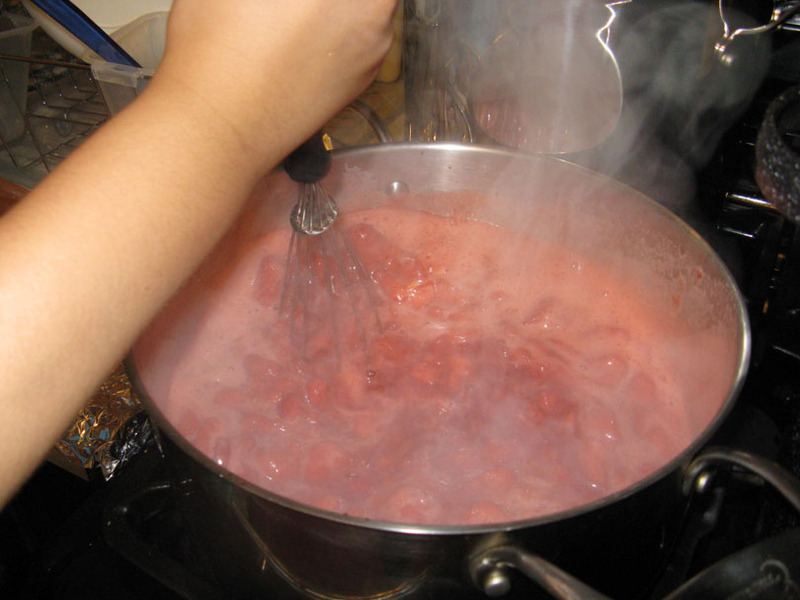 Jayde helped out by stirring the boiling strawberries. An hour and a half later, we were ladling our gelled jam into the jars, setting the lids on, lightly screwing the tops over the lids, and dropping the jars into the boiling water. We had to do this in two batches — the canner wasn't big enough to fit them all. have to dunk your fingers in the hot water to pick up the lids. 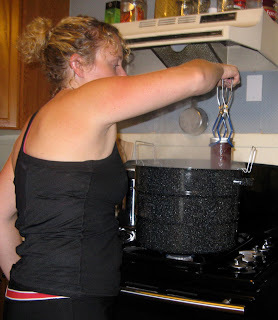 boiling water using specialized canning tongs. 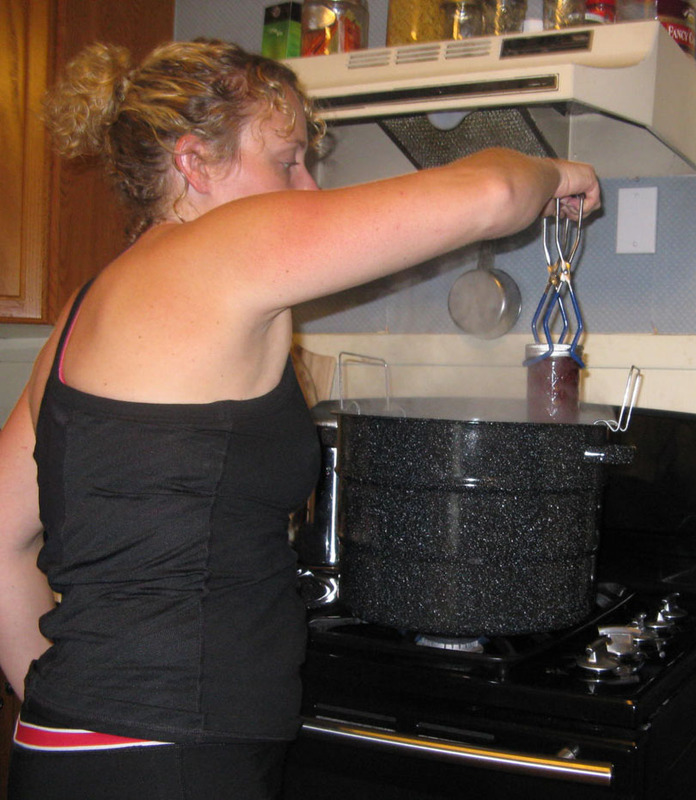 The processing time in the canner was only 10 minutes a batch. Once we pulled them out of the boiling water, we set the jars on a dish towel on the counter to cool and settle for 24 hours. The hot jars of jams have been set out on the counter to cool and settle. We yielded 12 jars on Sunday. But with all the time and energy we put into making the jam, Jayde and I decided to keep a few jars for ourselves. Of the 16 jars Jayde and I produced over the weekend, I brought 12 jars into work, I gave one to my niece and sister, one to my Gram, one I am keeping, and one I plan to give to my mom. My total count for work is up to 23 jars, enough jam to send to the trade reps. It looks like we will have to wait for the native blueberries to ripen to make the buyers’ jam. The native strawberries have a short growing season, and it has come to an end here in the Berkshires. That's okay; I don't mind waiting — a break from jam-making is welcome in my house. 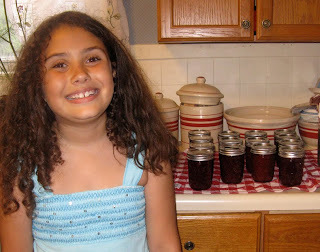 In total, Jayde and I made 16 jars of strawberry jam over the weekend. To complete the marketing project, I designed labels for the jam jars and sent them off to be printed. We will sticker each jar with a label and give a few extras to the reps and buyers. Our hope is that they will give the recipes in the book a try themselves, see and taste the fabulous results, and tell their bookstores to stock their shelves — it's a must-have! 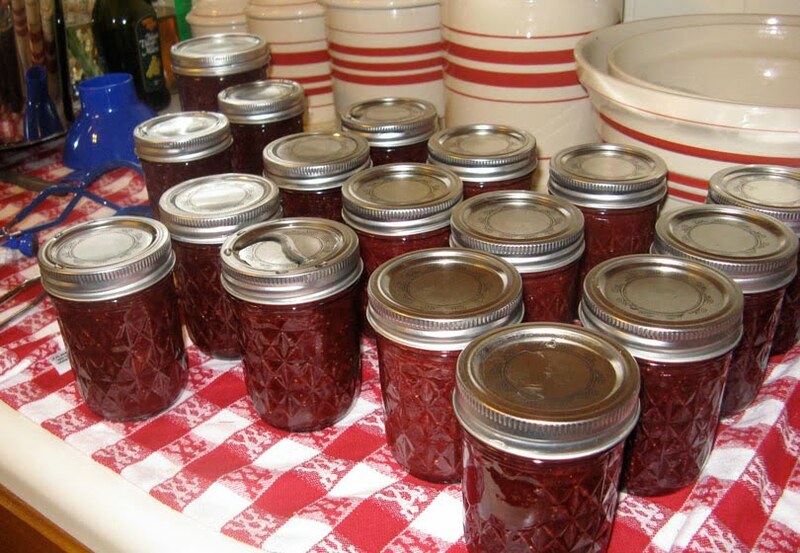 We will write "Classic Strawberry Jam"
above the line and place a label on each jar. Only time will tell if the jam and labels will be a marketing success. Those labels look like a great idea!